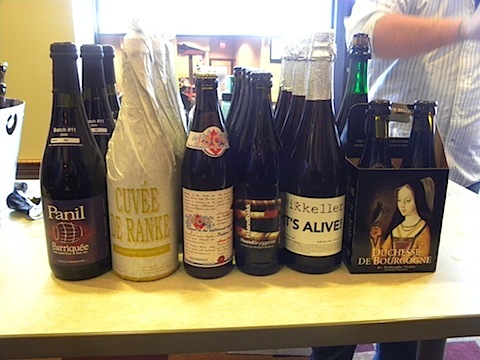 This weekend I attended a sour beer tasting at Gordon’s Fine Wines and Liquors. I heard about the tasting from Tina at Carrots ‘N’ Cake and immediately knew I needed to go. I’m a beer lover, as is, but when it comes to sour beers, there’s nothing better! 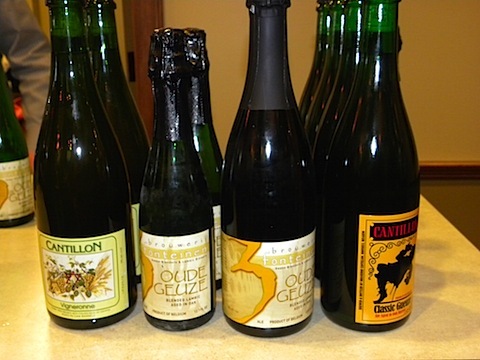 The event was a fabulous opportunity to try lots and lots of different sour beers. See the one called “It’s Alive”? Sounds scary, doesn’t it? And it totally was. It had a super funky-ish taste to it, but I obviously loved it. 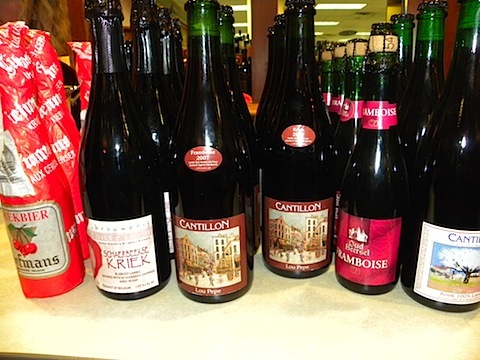 I think my very favorite beer of the day was the Cantillon ’97 Kriek; it was so flavorful and delicious. These were the fruity ones and were absolutely delicious. I’m not usually a fan of raspberry in my liquor (or artifically-flavored raspberry in general), but I actually loved the Framboise beers. And the cherry ones were awesome, too. The Flanders Red and misc. beers were definitely less sour than the rest and more like “normal” beers with a little kick. The event was “sour beers and cheese pairings.” We were almost ready to leave by the time the cheese arrived, but I’m so glad we didn’t miss it because the two we had were excellent. 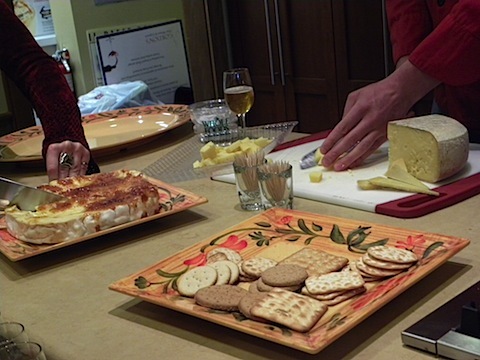 I’d love to come back to Gordon’s for another event involving cheese. 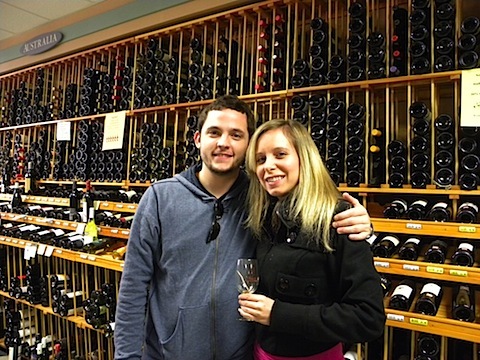 Me and Chris in the Australian wine section. 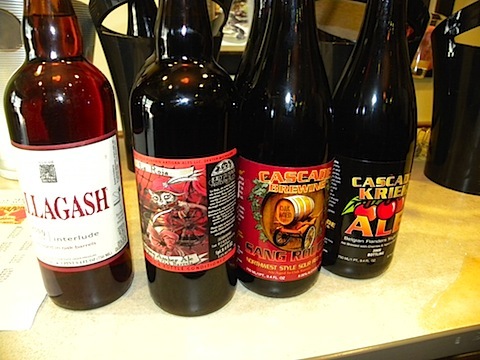 Gordon’s has an amazing liquor selection, and carries tons and tons of craft beers. 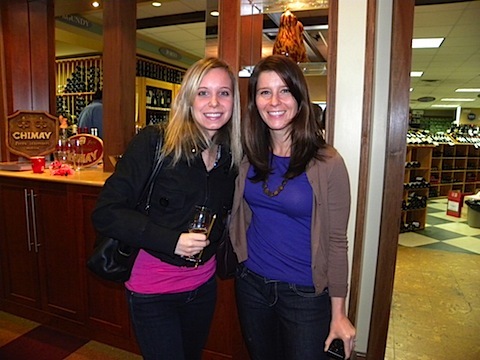 And we’ll definitely be back for more tastings! And, of course, I had to take a photo of Bethenny Frankel‘s Skinny Girl margarita. By the way, Bethenny just got married last night; woot woot! I’ve been meaning to try this truffle honey from Gourmet Attitude’s La Boutique de la truffle absolutely forever, but wasn’t quite sure what to use it with. When I went to my parents’ house to celebrate my dad’s birthday, I said I’d bring an appetizer. And since I’m obsessed with making flatbreads lately, I designed a new concoction. And realized truffle honey would be perfect drizzled over it! 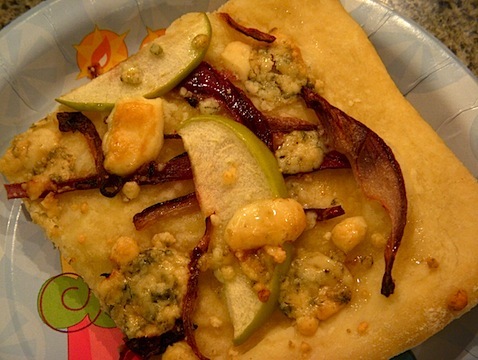 I made a flatbread with granny smith apple, red onion, and gorgonzola cheese. With truffle honey drizzled on top. 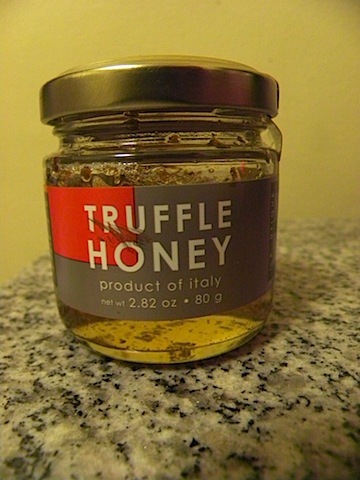 It was delicious and the honey had a super truffle taste to it. Now I want to drizzle it on everything! Or just eat it with a spoon. A couple weeks ago, the Superior Nut Company sent us lots of nutty treats. Sadly, Chels can’t eat nuts (or good for me, I guess! 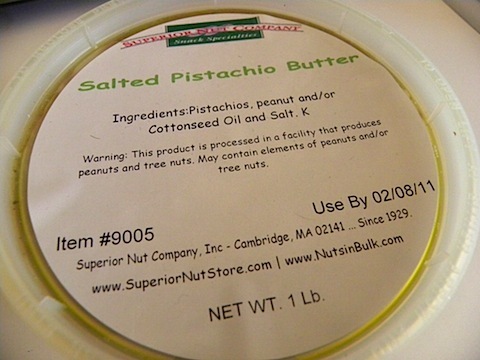 ), but I’ve really, really been enjoying the salted pistachio butter. I’m pretty much a peanut butter addict, but pistachios are my very favorite nut, so I knew I would enjoy this. I mean, I’ve tried everything from almond butter to sun butter to cashew butter; but for some reason, I’ve never had pistachio butter. Until now. I’ve been eating it the same way I would peanut butter. On my toast with a little bit of jam, in my morning oatmeal, or on an apple (OK, OK, and right out of the jar with a knife… no shame). It tastes JUST like pistachios and I love it. If you live in the Boston-area, you’ve probably heard of Jae’s Grill. There’s been a Jae’s in my neighborhood forever, but for some reason, I never went. 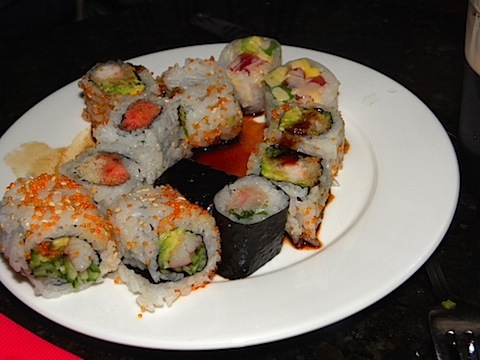 I kept hearing it was so-so, and with so much good sushi in Coolidge Corner, I never felt the need to stop by. 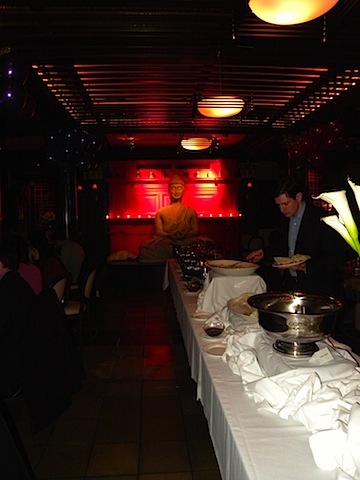 But Jae’s recently closed and the new Buddachen opened. My sister and Adam had an invite to their grand opening last week, and she invited me and Chris. At the grand opening, they basically let us try everything, buffet style. 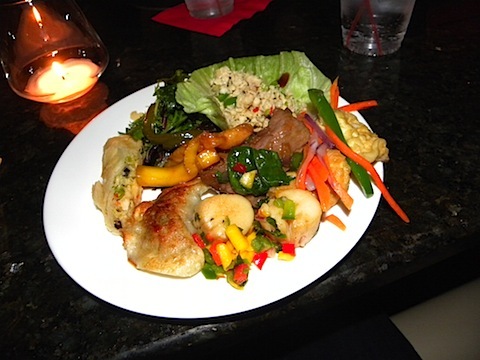 They had tons of delicious Asian-inspired food… I especially liked the lettuce wraps, beef basil, and scallops. And guess what? The sushi was awesome! 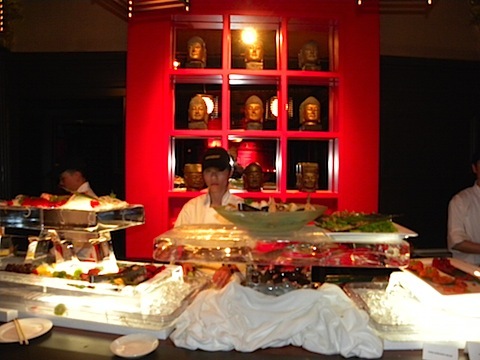 I’m often a bit skeptical of buffet style sushi, but you could see the sushi chefs were making the sushi fresh and continuously re-filling it. If it tasted this delicious at the grand opening party, I’m sure it’s even better when it’s made to order. To be honest, I don’t even know what kinds of rolls I was eating, but I do now the fish was incredibly fresh and I didn’t eat anything I didn’t like. 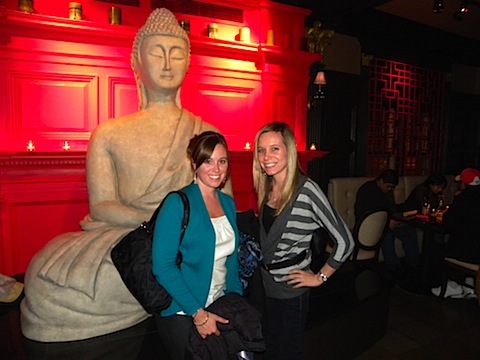 The atmosphere in Buddachen is super fun and trendy and, of course, my sister and I posed for a photo. Sushi chefs hard at work! Thanks to my brother-in-law, Adam, for getting some good shots of the restaurant! I’ll definitely be back at Buddachen to try more of their menu. 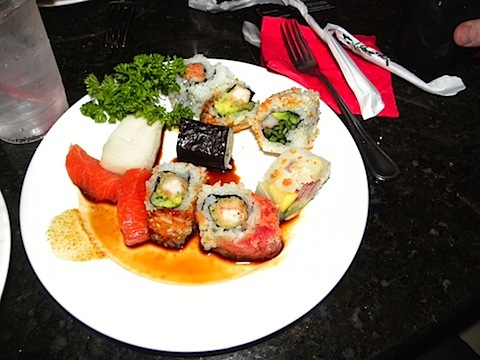 I’m seriously hungry for more of their sushi as we speak! Bostonians, in case you missed it, be sure to check out some great upcoming events in the area! 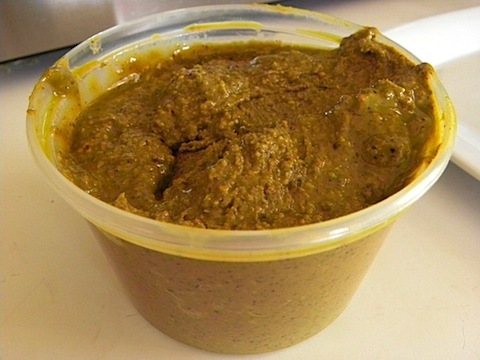 10 Responses to "Sues’s Favorite Things #11"
The pistachio butter sounds AMAZING…and I definitely can’t wait to try out Buddachen. I finally made a long overdue first visit to Regal Beagle and need to get out to Brookline more often! Oh no, now I’m craving sushi! 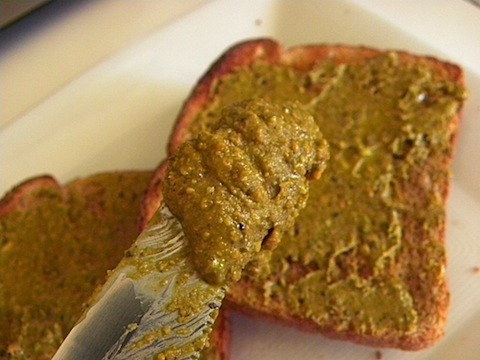 I’ll have to get my hands on some of that pistachio butter -it sounds amazing! 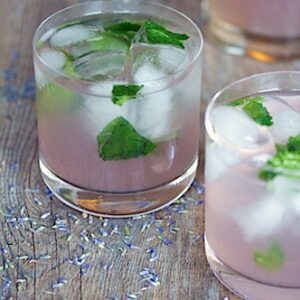 I so need to try a Gordon’s tasting! And I’d also love to try that sushi place. Thanks for keeping us updated on such great events and things around Boston! I missed these posts! I’ve been wanting to go to a Gordon’s tasting ever since the Wine Expo. I have a card and now get emails on a regular basis reminding me. 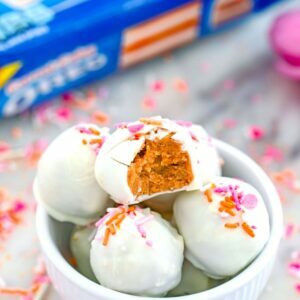 I still haven’t been to a good Boston foodie event — these look amazing! I can eat my weight in sushi. So while a sushi buffet does sound a tad sketchy, I know I’d be able to get over it knowing I could eat as much sushi as I could possibly stomach! Buddachen looks great! I’m so glad that you did a review of that place because it’s down the street from my house and now I have a new place to go – SCORE! Your flatbread appetizer looks so yummy! The apple and cheese make a great combo! ooooo I have never seen pistachio butter-that looks delightful! i’ll definitely pick some up when i see it! 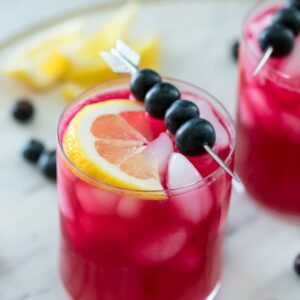 and you found skinnygirl drinks! I haven’t seen it in the boston area yet! 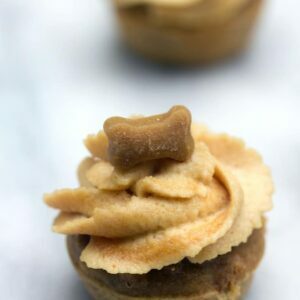 you girls are so on top of your food trends-love it!